The decision to embrace revenue transparency at Hubstaff was long discussed and extensively analyzed. My co-founder, Jared, and I went back and forth so many times it took two to three weeks to make a final decision. Going transparent is such a difficult choice because there are multiple benefits and consequences, so we ran through the lists and made sure we understood the impact of making our revenue open to the public. For example, one thing we were worried about is our competitors seeing our numbers and gaining a pricing edge. Ultimately, there were more positives than negatives, and we decided to make all of our numbers public. We went transparent down to the core of our business. If you wanted to, you could see the specific time a new Hubstaff user signs up, users who cancel, our churn rate and how fast (or slow) we are growing. It’s a big risk, but I believe it will pay off in the long run because it’s in line with the way we want to manage Hubstaff. So what exactly is revenue transparency? (Hint: The term does a good job of being self-descriptive.) 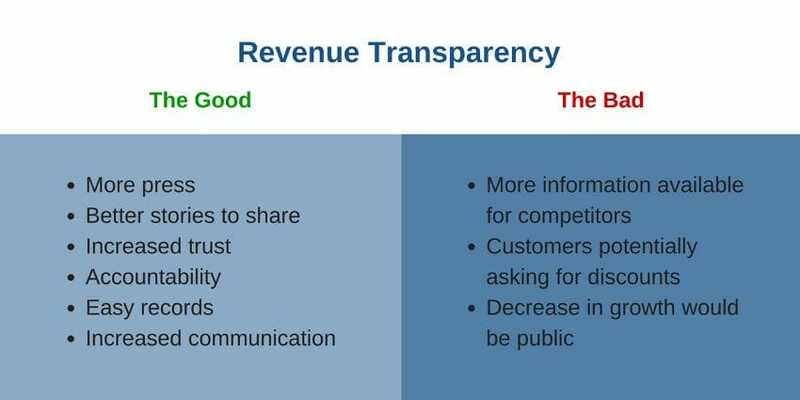 Revenue transparency is when a business shares their metrics with the public, embracing openness and allowing anyone who’s interested to see their real time growth in numbers. Plenty of successful startups are ahead of the pack and publishing their data so that anyone can see how much they make, monthly recurring revenue, costs and fees, number of customers and more. We found both internal and external benefits to being completely transparent at Hubstaff. For one, it’s a press-worthy decision. If someone wants to cover Hubstaff as a business, there is plenty of information available to report on. We received online attention simply for being one of the few open startups on Baremetrics. Going transparent gives us a better story to share with other bloggers, writers and startups. We can connect and discuss revenue transparency from a place of experience. Plus, making our records public provides an ongoing diary of work that we can reference. I believe that being completely transparent will ultimately result in increased trust with customers and potential customers. They will be able to see what we are doing based on hard data, so they can see that we are doing our best to provide a valuable product that people love. Publishing our data also keeps our team accountable for their experiments. 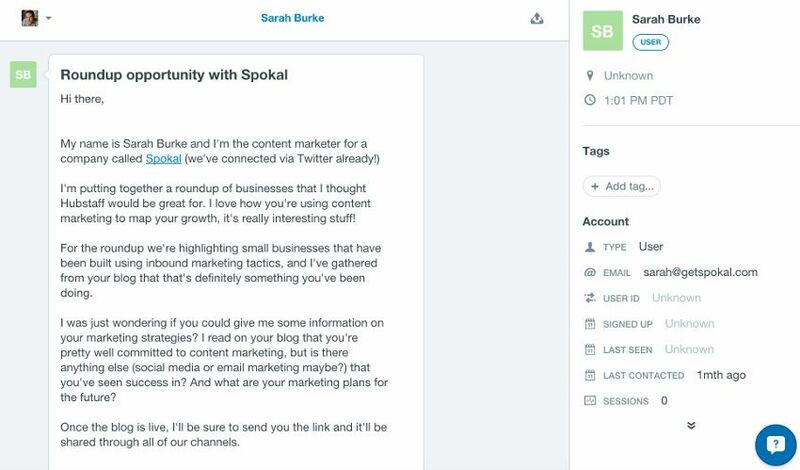 Since everyone can see spikes in sign ups, revenue and churn, we can all tell whether things like the new feature or newsletter template did well. Seeing whether something caused shift in our metrics helps us learn about what works and what doesn’t, and it’s an efficient way to communicate important lessons to our internal team. Finally, I knew that our teams would take more care in tracking and documentation knowing that they will have to write about it in a public space, with public data later on. If you want an example of what I’m talking about, view our previous post on how we grew our social media traffic by 350% by Madhav, our Growth Jedi. Both Jared and I knew that there would be a lot of risks that come with revenue transparency. Our competitors could see our numbers and our pricing “sweet spot” and adjust their own fees to be even more competitive. There’s also the possibility of new competition arising because they see a success story in our numbers and want to recreate it. For example, if they see our company has a high growth rate, a new startup could invest in the concept because they would know the market is expanding. By the way, for an alternate take on the idea of new competitors arising, check out this great Buffer post on Why No One Will Steal Your Startup Idea. Another risk is that customers could see some of our discounts and ask for them, even if they’re not eligible. For example, they might read “That Company” upgraded to such-and-such plan for this much money. The plan might be the same as theirs, but priced lower for a number of reasons (part of a larger organization, be an affiliate, etc.). The customers who are paying our actual plan price could demand the same rates as the ones they saw, because they don’t get the entire story. The final thing we were worried about is what would happen if our churn rates rose, or our growth fell. Customers and potential customers could see these negative stats and go with a different time tracking service instead. There are times when knowing too much leads to uncertainty, simply because there’s a lot of information that’s hard to process. This is another big reason we decided to embrace revenue transparency. We are already a pretty transparent company internally (I’ll discuss how our team members communicate openly with Trello further down the article). Becoming a publicly transparent company is a good and logical next step because it fits with Hubstaff’s vision of how work should be done. Our entire product is built around transparency, with work monitoring tools and an easier way to communicate. I’ve managed remote teams for years, communicating virtually and making sure work got done. Hubstaff was born out of a desire to do all of this better. Our time tracking software takes screenshots and records activity levels so that you can see how productive an employee is and a clear picture of the work being done. We are also in the process of testing out new features that also tracks the URLs visited and different apps used (ie. Skype, web browsers, etc.) We are building a transparency machine. When some people look at Hubstaff, they see time tracking with employee screenshots and think “big brother,” but what we are really building is a better way for virtual teams to operate. Hubstaff technology helps virtual teams work more cohesively, transparently and efficiently; all the work your employees do is right there in real time for you to check without having to send a single email. In a remote team, you have to embrace transparency. Many of the companies that have revenue transparency and make their data public are virtual companies with distributed teams. Transparency is the defacto in a remote team, and we know that without it, it’s extremely hard to operate. At Hubstaff, everyone’s responsibilities and accomplishments are transparent so there are no misunderstandings and minimal mistakes. We learn better by publishing our data and being more transparent in the reports we give. I create growth posts from personal experience and make quadruple sure my numbers and data are correct, because if they aren’t you can easily find out. Knowing that we will publish a test or strategy with our public numbers to back it up holds us to a higher standard. Here are a few ways we share our internal information with the world, which will be covered in more detail further in this post. These posts are all about how we grow our company. The article you’re reading now is part of the series, detailing a specific step and important decision we made. These posts are all about how we use technology to build the infrastructure of Hubstaff. We share what tools we use, why we choose them, how they’ve worked for us, and even some of the tools that didn’t work out for us. This is a compilation of guides, posts and videos freely available to the public. These resources are where we share exactly how we manage our virtual teams and business. We used Baremetrics as the publishing platform for our revenue information. We chose it because it presents our data in easily digestible formats and the monitoring is mostly automatic once we integrated our accounts. View the Hubstaff Revenue Dashboard to view the efficient reporting systems that Baremetrics provides. You can see a live feed of what’s been going on in our startup, and graphs that give a quick snapshot of our numbers and growth. This is how we remain transparent internally. 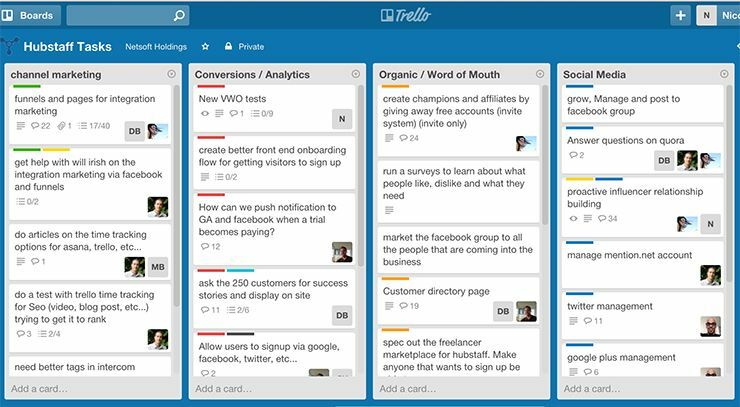 We use Trello to manage our marketing efforts, and we have a massive board full of everyone’s work. All our team members can communicate and see assignments, due dates, checklists and what’s going on in a certain project–even the ones they aren’t assigned to. Above is a snapshot of what our Trello boards looks like right now, and any of our team members can see and read through the tasks. For example, if I hire new team members, all I have to do is add them to our Trello board and they can read all the things we’ve done for our blog. They can go through discussions, requests, previous posts and more. This blog series shares everything that we do to grow our team and Hubstaff. It has our successes and failures, the methods and strategies we used to get there, and what we learned along the way. This article one of many in the Hubstaff growth series, alongside articles on software we use to grow Hubstaff and our investment decisions. The growth blog is a completely transparent and honest analysis of our growth efforts, and anyone can follow along as I share what works and doesn’t work to grow our startup. We use a lot of tools at Hubstaff, partly because we are a virtual team and partly because these tools can make any business more efficient. We have a lot of faith in the tools we choose, so we are happy to share them. Our tools blog goes over what works for us and what doesn’t in terms of email management, customer support software and how we measure results. By following this blog series, anyone can learn about the tools and services Hubstaff uses to operate. This transparency ensures we only recommend tools that we have used and experienced (and liked) first hand. For example, we can recommend using Heroku as a platform service because we do it and know that it worked well for us. The team at Hubstaff is comprised of experienced, skilled professionals who excel in their fields. We’ve compiled a resource of guides, posts and videos that capture their expertise and share it with the world. Hubstaff University shares what we’ve learned in order to operate better as managers, contractors, virtual teams and more. Viewers can get a definitive guide to building a remote team, an employee handbook for productivity and a guide to resolving management issues, which are all based on personal, first-hand experiences from our founders and leaders. We discuss what we know coming from a place of authority and we are completely transparent about it. We gained numerous links out due to this move for revenue transparency. 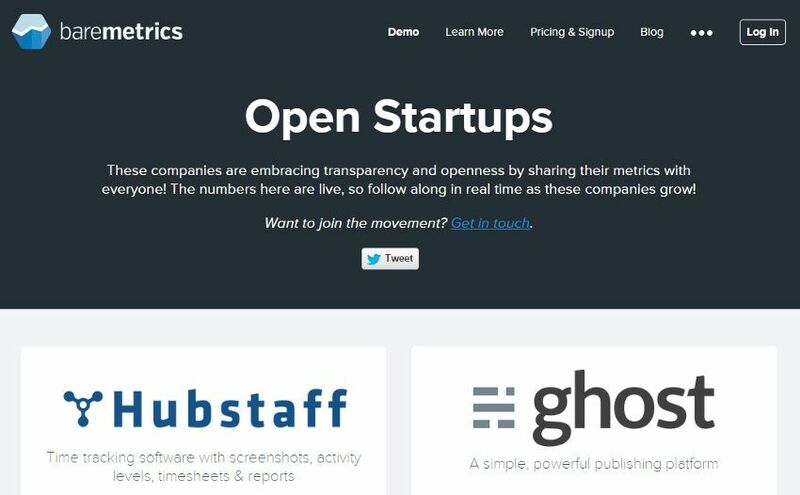 Hubstaff is listed on Baremetrics as one of the few open startups that are publicizing revenue numbers, we got a mention on the Buffer blog and Venture Beat for our decision, and we are on Income Reports’ dashboard of public revenue reports from around the web. Baremetrics – This site has a space for all open startups so that the public can easily view all revenue made transparent with Baremetrics. There are currently eight startups sharing their metrics using Baremetrics. Venture Beat – Venture Beat did an article on how anyone can watch open startups earn in real time with Baremetrics. They showed Hubstaff as one of the open startups. Buffer – Buffer Open is their blog on transparency. In their post about revenue transparency, they list Hubstaff as one of seven startups that are part of the initiative. Earning trust is the most valuable effect of revenue transparency. I’ve heard it from other founders I spoke to and I agree with them. Being open with our communities and becoming a trusted company is worth risking any of the cons Jared and I listed out. Revenue transparency makes a company vulnerable, but it also shows the world we have nothing to hide. When Hubstaff went public it was more than just proving we were working hard, it showed that we are proud of what we’ve built and we don’t want to hide it–any aspect of it. More often than not, we found that people get behind us and help because we have a transparent business model. They can see that we work hard and we’re honest about what we do, so they want to reward us. Once we got over the big jump and published our data, it became easier to be happy with the decision. We saw so many positive things, both immediately and in looking ahead to the future, that we decided if we lose any opportunities for making our numbers public it was worth the trade off. We believe that more positive than negative will come from revenue transparency, whether or not we see it. Transparency is the new way to do business. It keeps us accountable to our audiences (this includes our employees) and is a great way to show the world what we’ve been doing. As a founder, I’m often excited when I see our churn rates drop and MRR go up. With public stats I can easily point to, this excitement is easy for me to share with others. Overall, my hunch is that revenue transparency and publishing data will become a popular way to operate, and at Hubstaff we’re seeing exciting results as one of the first startups to do it.